Vehicle accidents can cause many devastating injuries, and this is particularly true when a damaged vehicle catches on fire. Often, fires resulting from a crash are more harmful than the collision itself. Leaking fuel tanks and lines. Gasoline leaks from defective fuel tanks are the most common cause of vehicle fires, and poorly-routed or defective fuel lines can also rupture during an accident. Even a small leak can quickly lead to a raging fire, and a single spark can ignite it. Electrical system failures. Modern vehicles have a lot of wiring that may be damaged in a collision. A severe impact can sever wires and cables, causing sparks that ignite fuel or combustible fumes. Burns. 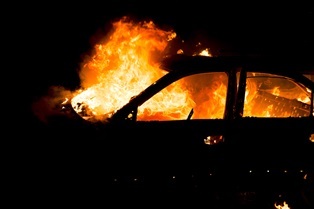 Vehicle accident burns occur when a victim touches hot metal, hot coolant, or steam escaping from a damaged radiator. The most critical burns cause scarring, amputations, and even death. Toxic exposure. Automotive fires often happen in the release of extremely toxic fumes as the vehicle burns, leading to respiratory problems and lung damage. If you were injured in a vehicle fire, you might face expensive medical care and a lack of income due to missed time from work. When a defect in design or manufacturing causes fires, crash victims are entitled to pursue compensation from the vehicle manufacturer. If another motorist caused the collision leading to the fire, the at-fault driver may also be liable for your medical bills, loss of income, and pain and suffering. You need an experienced vehicle accident attorney to help you receive the compensation you deserve. To learn more about what the law offices of Steve M. Lee, P.C., can do for you, visit us on Facebook.